John Turturro as Arnold, Gloria's love interest. Michael Cera as Peter, Gloria and Dustin's son and Anne's brother. Brad Garrett as Dustin Mason, Gloria's ex-husband and Peter and Anne's father. Holland Taylor as Hillary Bell, Gloria's mother. Caren Pistorius as Anne, Gloria and Dustin's daughter and Peter's sister. Jeanne Tripplehorn as Fiona Mason, Dustin's new wife. Rita Wilson as Vicky, Gloria's friend. On May 12, 2017, it was reported that Sebastián Lelio would direct a reimagining of his 2013 film Gloria starring Julianne Moore. "As one of the greatest actresses in the world, Julianne giving her interpretation of the character is not only a huge honor, it's irresistible. It's going to be like jazz, you'll feel the spirit of the original story but it'll be re-invigorated and vital," said Lelio. On November 16, 2017, it was reported that the film had begun production. John Turturro, Michael Cera, Brad Garrett, Holland Taylor, and Caren Pistorius also joined the cast. It had its world premiere at the Toronto International Film Festival on September 7, 2018. Prior to that, A24 had acquired U.S. distribution rights to the film. It was released on March 8, 2019. As of April 20, 2019[update], Gloria Bell has grossed $5.5 million in the United States and Canada, and $1.1 million in other territories, for a worldwide total of $6.5 million. The film made $145,218 from five theaters in its opening weekend, the second best per-venue average ($29,044) of the weekend behind the blockbuster Captain Marvel. In its third weekend, the film expanded to 654 theaters and made $1.7 million, finishing eighth. On review aggregator Rotten Tomatoes, the film holds an approval rating of 91% based on 127 reviews, with an average rating of 7.64/10. 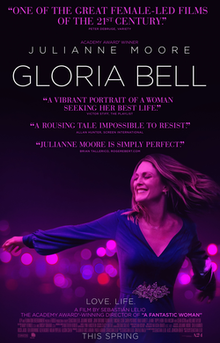 The website's critical consensus reads, "Free of visual or narrative embellishments, Gloria Bell rests almost completely on Julianne Moore's performance in the title role -- and she's gloriously up to the task." Metacritic gave the film a weighted average score of 80 out of 100, based on 37 critics, indicating "generally favorable reviews". Gwilym Mumford of The Guardian gave the film 4 stars out of 5, saying, "there's a warm universality here that is absorbing in its own right." Stephen Dalton of The Hollywood Reporter wrote: "Although he reconstructs the original film's narrative virtually scene by scene, Lelio strikes a more overtly comic note in Gloria Bell than in the original." Peter Debruge of Variety called it "one of the great female-led films of the 21st century, passing the Bechdel test with flying colors — which explains why Moore would be so keen to remake it." ^ "Gloria Bell". Toronto International Film Festival. Retrieved August 14, 2018. ^ a b c "Gloria Bell (2019)". Box Office Mojo. Retrieved April 21, 2019. ^ a b "Gloria Bell (2019)". The Numbers. Retrieved April 16, 2019. ^ Ford, Rebecca (May 12, 2017). "Cannes: Julianne Moore to Star in Re-Imagining of Sebastian Lelio's 'Gloria' (Exclusive)". The Hollywood Reporter. Retrieved November 21, 2017. ^ Kroll, Justin (November 16, 2017). "John Turturro and Newcomer Caren Pistorius Join Julianne Moore in 'Gloria' (EXCLUSIVE)". Variety. Retrieved November 21, 2017. ^ Lang, Brent; Keslassy, Elsa (August 20, 2018). "Toronto: A24 Nabs Julianne Moore Film 'Gloria Bell' (EXCLUSIVE)". Variety. Retrieved August 20, 2018. ^ D'Alessandro, Anthony (March 31, 2019). "How Universal Drove Jordan Peele's 'Us' To $70M+ Opening, The Best Start For A Live-Action Original Since 'Avatar' – Update". Deadline Hollywood. Retrieved March 24, 2019. ^ "Gloria Bell (2019)". Rotten Tomatoes. Retrieved April 7, 2019. ^ "Gloria Bell reviews". Metacritic. Retrieved April 7, 2019. ^ Mumford, Gwilym (September 10, 2018). "Gloria Bell review: Julianne Moore predictably brilliant as dating divorcee". The Guardian. Retrieved November 8, 2018. ^ Dalton, Stephen (September 8, 2018). "'Gloria Bell': Film Review | TIFF 2018". The Hollywood Reporter. Retrieved November 8, 2018. ^ Debruge, Peter (September 7, 2018). "Toronto Film Review: Julianne Moore in 'Gloria Bell'". Variety. Retrieved November 8, 2018. This page was last edited on 21 April 2019, at 19:20 (UTC).